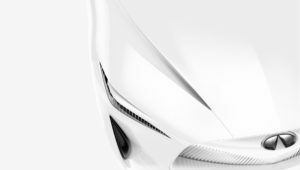 Infiniti has released a teaser image of a new concept car due to have its World debut at the North American International Auto Show in Detroit January 2018. The concept previews a new generation of Infiniti vehicles and represents the first manifestation of a new Infiniti form language. Karim Habib, Infiniti Executive Design Director says the new Infiniti concept car will take the traditional saloon architecture to its next stage of evolution. A shift towards smarter, more compact and less intrusive powertrains; We were able to create an alternative form with flowing gestures, more engaging in character and more enriching in experience. With its long cabin, balanced proportions and muscular stance, the concept heralds in a new era for Infiniti models.